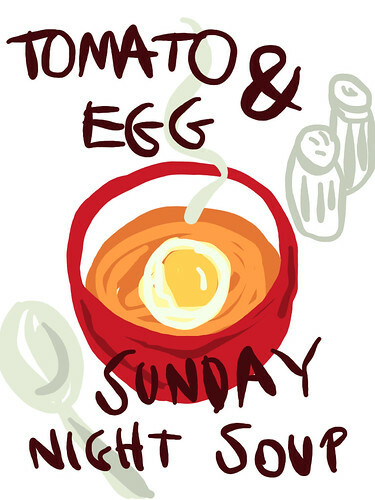 Tom&egg Soup, originally uploaded by Lobstersquad. Fridge raiding night; jamón, omelette and artichokes for J, salmon bits for Pía, an egg poached in tomato soup for me. Like a strange marriage between a can of Campbell's and sopa castellana. Posted by lobstersquad at 10:05 p. m.
comoe se prepara poached egg en sopa? i have leftover sauce from making clams in linguine (tomato, parsley, spicy peper flakes, garlic) and i think cooking eggs in it would be great! usually i make my poached eggs in a little container floating in simmering water, i'm scared to just drop the egg into liquid!